Level 2 (Anger): Meet the Bear NPC. He is grumpy and will not let players pass. 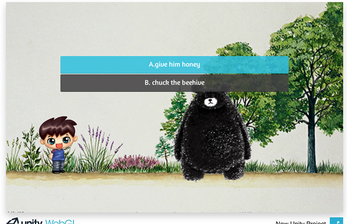 In this scene, player may click and drag a beehive sprite to the bear. This will then give the player 2 choices: Either give honey to the bear or chuck the beehive at him to knock him out. After giving honey, bear will thank player and let them pass. But he will also tell player that this doesn't change anything. If player throws the hive, the scene will fade to black and a bloody punch sound will be heard. The scene fades back into a creepier/darker version of the original scene and the hurt/bloody bear will say that the player cannot escape from their actions.